Our iPhone & Samsung Galaxy ultra clear & flexible rubber cases are made of premium TPU Clear Rubber Silicone that provides MEDIUM level protection for your mobile device. 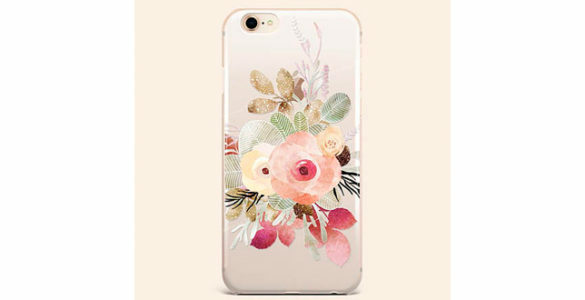 If you’re looking for more protective Tough case please visit our 3D Form Case Section http://etsy.me/1q1VC4f that offers Tough Cases with Clear Inlays or our 2D Form Case Section http://etsy.me/1WKXWtf that offers wide variety of Tough cases. **GRIP CASE** Hello Nutcase Grip case provides MEDIUM PLUS level protection for your mobile device. Our Clear Rubber Grip case is for iPhone 7 & 7 Plus with thickness measured at 0.05 in / 1.27 mm. Hello Nutcase Grip style case has ruffled sides and provides excellent grip while it’s ergonomic design ensures comfortable feel in your hands. It’s perfectly engineered case with reinforced corner protection for drops and protective lip above the screen level. Case covers all edges and conceals all device buttons allowing easy access to all ports (please see info image in the listing for the side, top and bottom views of the grip case). It’s simply stunning case that offers all – perfect grip, maximum protection and stylish look without being bulky! For more photos please follow us on Instagram @hellonutcase and see our Etsy Updates section. **SLIM CASE** Hello Nutcase Slim Clear Rubber case thickness measures 0.04 in / 1.1 mm. iPhone SE case is slightly thicker – 0.07 in / 1.8 mm. Case covers all edges and conceals all device buttons allowing easy access to all ports (please see info image in the listing for the side, top and bottom views). Our rubber cases have a small raised front side lip, that helps to protect your device’s front side. It is a slim stylish snap-on crystal clear rubber case that is an absolute must have! We do not use stickers, decals or glued-on images on our cases. Our cases are designed in our NJ Studio & printed with the latest UV printing technology & inks that provide absolutely gorgeous texture & vibrant color hues. Once the graphic is printed it is scratch & fade proof. Our form-fitting rubber cases are made to be easily placed & removed from your device – no more broken nails, ladies! It’s minimal yet stylish, lightweight yet protective, soft & flexible, simply gorgeous – allowing instantly showing off your awesome rose gold, silver, and gold phones! “Hellonutcase” watermark will NOT appear on your case. It’s added to protect our designs. All cases are made to order. Please allow 3-4 working days for production. We will ship the item within 3 – 4 business days after receiving payment with USPS First Class Mail service. We will notify the buyer after shipping via email.